I love anime music and it is one of the main things I look forward to each new anime season. And as we have 60 new anime this season, we also have 60 new openings and endings—in addition to the new second-half themes from the winter anime that are still on the air. So below are some of my favorite opening and ending songs from the anime that are currently airing during the spring 2014 season in Japan. Why Do I Love It? : Who knew that adding a multicolored trail to a fan dance would be so beautiful? Moreover, the dance is choreographed to the song so both the visuals and music work together perfectly. 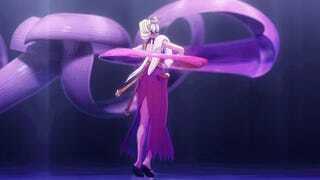 Song: "BRYNHILDR IN THE DARKNESS -Ver. EJECTED-"
Why Do I Love It? : This is a song with no lyrics that gets you pumped up through a constantly building cord progression with a bit of dubstep and operatic choir vocals thrown in for good measure. Why Do I Love It? : A song that screams ‘80s is a perfect fit for the most ‘80s anime to come out in decades—and given that a large portion of the story takes place in Egypt, the song is all the more apt. Why Do I Love It? : This is a beautiful looking opening and shows off the series’ bright animation style to its fullest. Moreover, the song itself has an excellent build up to the chorus and is one of the few of the season I often leave on repeat while I work. Why Do I Love It? : If you are a fan of the first opening to Sword Art Online, you know what to expect from a song by LiSA—and this one doesn’t disappoint. Coupled with great visuals of flashy magic and epic-looking battles, it’s one I never get tired of watching. Why Do I Love It? : A somewhat slow, uplifting song juxtaposed to scenes of mecha battles with monsters always makes for an interesting watch that primes your emotions for the episode to come. Why Do I Love It? : The intro of the song is haunting when combined with the image of a little girl sleeping in the ruins of a destroyed building. The rest of the song, while of a quite different tone, isn’t half bad either. Song: "Tsukiyabureru - Time to SMASH!" Why Do I Love It? : If you have ever watched Gundam SEED (or numerous other mecha/shonen anime), you know what to expect from a T.M. Revolution song—and combining it with animation showing children who basically keep the Avengers in pokéballs makes for an opening that gets a laugh out of me every time. Song: "Itsuka no, Ikutsuka no Kimi to no Sekai"
Why Do I Love It? : It’s a laid back song that’s enjoyable in and of itself, but add to it images like the rain of words in the animation and it turns into something really beautiful. Why Do I Love It? : It has a truly interesting song that alternates between a militaristic march (with a cord progression commonly found in traditional Japanese music) and a fast-paced J-pop track that sounds like it was pulled straight out of a music game.